The Vegetarian Festival (‘Thetsaken Kin Che), also known as the Nine Emperor Gods Festival, is celebrated throughout Thailand in the month of October. Thai/Chinese descendants, practice abstinence from eating meat and stimulants believing that it will bring about good health and peace of mind to the community. The event has its history in Taoist tradition, but it is clearly practised by Buddhists. 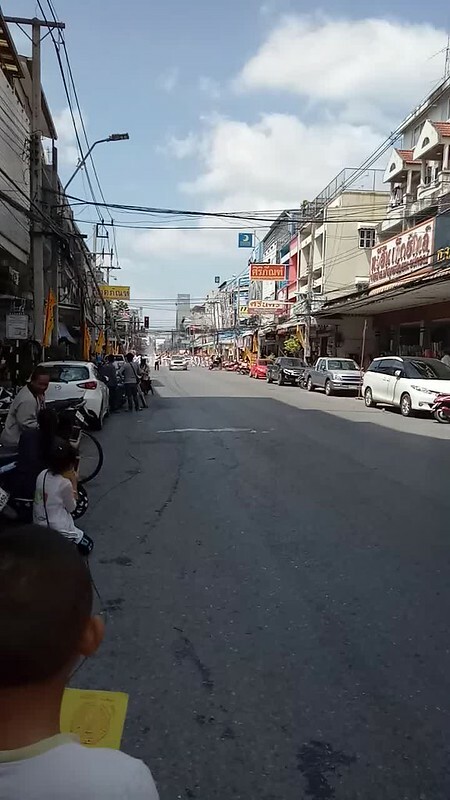 The images I post here are from this year’s parade (2018) as it wound its way through the centre of the old city, Korat. On route businesses and people are blessed (and strangely) ritual mutilation is performed. Several men and women impale their cheeks with sharp metal and bamboo sticks decorated and undecorated. Cut their faces and light firecrackers close to their bodies. They also had evidence of cutting on their backs. They seem to appear embodied with the spirits and blessed people (including myself) kneeling at the side of the road, these devotees used their Temple flags which were wafted vigorously over the heads of the kneeling worshippers. No doubt to cast out evil spirits and bless for good health. Some even painted a red mark just between the eyebrows of the worshippers. At the bottom of this article you will also find a short video of the firecrackers and devotees. Wang Matcha Restaurant – Nakhon Ratchasima- Thailand Wang Matcha* Restaurant is in Korat city about four km from the city centre, Korat. I don’t usually write about wining and dining but this is one place you will want to write home about and share with your friends. I haven’t come across a restaurant like this in Thailand. The layout of the restaurant Wang Matcha Restaurant consists of a huge lake about 150 m x 100 m with pavilions all round the lake that serve as dining rooms. The main restaurant building, where the kitchen is located, has both indoor and outdoor dining facilities. The small pavilions around the lake are suitable for small groups of friends who would like some privacy and to be away from the crowd. The whole place has a natural ambience with lots of trees, plants and garden lighting. There’s a windmill in the middle of the lake that’s lit up at night. Plus a pavilion of live music! The distance of the pavilion at the southern corner of the lake to the kitchen in the main building is about 150 m. How then are diners going to get their food in time? Simple, food is delivered by speed boats racing across the lake. Wang Matcha* Restaurant is in Korat city about four km from the city centre, Korat. I don’t usually write about wining and dining but this is one place you will want to write home about and share with your friends. I haven’t come across a restaurant like this in Thailand. Wang Matcha Restaurant consists of a huge lake about 150 m x 100 m with pavilions all round the lake that serve as dining rooms. The main restaurant building, where the kitchen is located, has both indoor and outdoor dining facilities. The small pavilions around the lake are suitable for small groups of friends who would like some privacy and to be away from the crowd. The whole place has a natural ambience with lots of trees, plants and garden lighting. There’s a windmill in the middle of the lake that’s lit up at night. Plus a pavilion of live music! The distance of the pavilion at the southern corner of the lake to the kitchen in the main building is about 150 m. How then are diners going to get their food in time? Simple, food is delivered by speed boats racing across the lake.